I normally leave the blogging to the boys, but I thought it might be interesting to hear how I’m getting on nearly a month into my first expedition, and in particular the last couple of days, well 60 or 70 hours because the days all run into one up here…. With all the drama of the last few days we really needed to take stock of what it is we are doing and if we are going down a dangerous road. I do feel that while situations we found ourselves in were dramatic we all clicked into gear and made the right decisions at the right times, we all knuckled down and the team dynamic was fantastic. This expedition has been in the planning for nearly two years; very early on we decided the best vessel for the journey was an ocean rowing boat. This would allow us to have a craft that was capable of handling very rough sea conditions we expected on the long crossings some over 150k in length. We didn’t feel this was possible in a smaller more maneuverable craft like a sea kayak. The planned crossings have not been possible because of the ice coverage and the danger of ending up in a soup of massive icebergs. To avoid this we have had to stay much closer to the shore and skirt around the bays like one would in a smaller craft. The difficulty with this is that the ocean rowing boat is much more susceptible to wind. So the danger is that we are blown away form the shore out to the ice that lurks off shore. This is absolutely not an option as the boat would be destroyed and we would be in serious danger. The only available option is to do as we have been doing and to travel when we can. You cannot imagine how frustrating this is, we make light of it but it eats at you every minute you are not moving forward. That is why we dragged the boat along the shore for nearly 100k, and is possibly why we have been flying closer to the wind then we ever intended. We have simply been trying too hard. Traveling in the arctic is about patience. You will not meet any of the local people around here who gamble with the weather, you simply wait, and if the situation doesn’t improve sufficiently you wait some more. There is no sense in pushing on, as Mother Nature is right on top of her game up here. If you make mistakes or push your luck you get punished. We have accepted this and will pick and choose our movement even more carefully going forward. Having the personalities we have on our team this is possibly the most difficult thing for us, pushing on would be easy… as ridiculous as it sounds. When I went looking for something like this trip I was told by all the experienced people I met that the mental side is the hardest part. We have proven that we can grind when we need to and we have proven to ourselves that as a unit we make the right calls when the chips are down, now we need to did even deeper and find more patience… not an asset I have possessed in abundance in the past, but I came here to find out about myself I guess and its surprising that with all the action going on it could be a lesson in patience that I find the most valuable..
We awake to calm seas gently lapping our refuge bay. The telltale sign of change is the stillness of our cabin but it’s often easy to miss. The gentle rocking of the boat and the sudden silence from a screaming wind has a tendency of keeping one asleep rather than rousing them to work. We rally quickly and begin retracing our lost ground across Sellwood Bay reaching our previous high point within a couple hours. The day unfolds nicely with light winds and comfortable temperatures being the mood of the moment. Deterioration in the weather begins on the fourth rowing shift when offshore riffles begin to build quickly. We’re near land, skirting the inside of a large field of broken ice, and make for the best lee we can find. Our options are much more limited now that we have lost our anchor but we find a suitable moorage on a gravel beach and rest until things settle. After the trials of the last 36 hours we are gaining an appreciation on how quickly things can change up here. The winds die by 2:30am. It’s Frank and my shift and we head out into a drizzly morning shrouded in arctic fog. Our visibility is a mere 50 meters and we travel solely by the aid of GPS and compass. It’s an eerie sensation moving forward, seeing nothing in a milky blankness until the contorted form of a decaying chunk of ice glides past, a weary foot soldier returning home from some far off battle. The seas begin to change as we round Cape Parry, the deep breathing of an ocean swell beginning to make itself felt. Within minutes the winds have blown up and are pushing us hard into open water. The fog remains thick and we loose all sight of land. Steep waves reflected from the invisible cliff walls of the cape are mixing with the big swell of the gulf and the chop from the wind. We begin to spin in circles and can’t find our line. At first we think our GPS has gone haywire but regardless of how hard we try our bow is forced around and we spin wildly. A strong current appears to be in this mix and we can’t break free from it. The wind has built into a very strong blow and is pushing us into open ocean, into the heavy pack ice of the gulf. After our ice ordeal a couple days ago this is the last thing we need at the moment but it’s happening nonetheless. Eventually we manage to hold a straight line in a southeast direction, 45 degrees to the wind driven wave direction and start rowing hard. We want to get as far away from the crazy waters of the Cape as fast as we can. Unfortunately our direction is away from land, out into the gulf, right into the path of the pack ice. Our GPS indicates there’s a tiny island, no more than a speck really, smack-dab in our existing path. It’s a stroke of luck at a moment when not much is being passed around. If we can hold our line we may be able to make land on it. The seas are building and the fog remains thick. Frank holds a line that will drift us about a kilometer above the island where we can turn and surf our way down to it. Or it least that’s the plan. It’s a tense 30 minutes battling cross-seas to make our turn. The scream of the wind dies as we start to glide with it. “It’s like landing a paraglide on a postage stamp” Frank quips. Sitting among white-capping rollers we race towards our island shrouded in fog. Paul and Denis come on deck to help us spot, facing backwards in a row boat takes some getting used to and, in times like these, is not very practical. One hundred and fifty meters out and Paul hollers “Land ho”. Out of the mist a dark shadow appears, steep cliffs, crashing waves, little hope. We begin to ferry sideways to see if there’s any potential landing point. On the far side there’s a steep gravel beach, 40 meters wide, totally exposed to the waves, our only choice. The waves push us in hard. Paul steers the Arctic Joule as Frank and I maintain a steady row. We hit the beach, leap out and keep the stern perpendicular to the surf. It’s a drill we mastered on Sellwood Bay a couple days back. 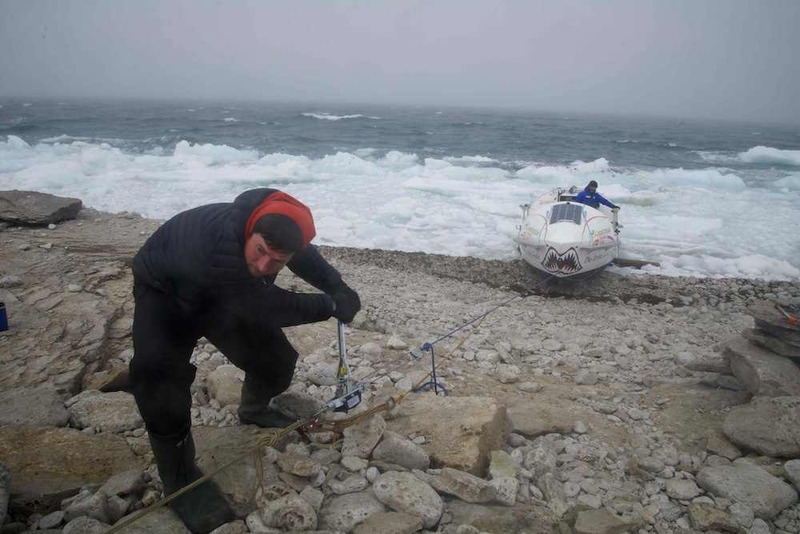 Denis and I quickly set up a winch-pulley system while Frank and Paul control the boat and we haul the Arctic Joule ashore. Somehow we managed to hit this tiny islet in the midst of a storm with zero visibility. Had we missed it we would have been pushed straight out into the grinding pack ice of The Amundsen Gulf. I’ve never been happier to be on terra-firma. Arriving on Refuge Islet – as we’ve come to call it – results in round-the-clock work as our storm has worked itself into a gale. By late evening huge chunks of ice are everywhere, blown in by the incessant wind, and they’re stacking up along our beach. Most are small to medium sized ice flows but one is a towering giant well over 40 ft in height. We haul the boat as high up on the beach as our winch system will allow and wait. 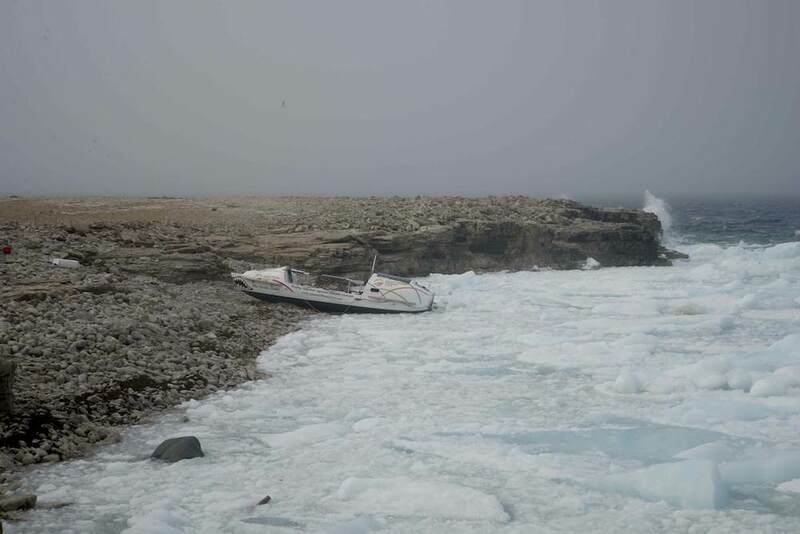 By morning our boat is encased in a slushy porridge of ice with larger chunks growling about. The storm has intensified has switched direction and bears down right on the boat. If it wasn’t for the surrounding ice moat, the Arctic Joule would be pummeled. The forecast isn’t promising with lots of high winds in the days ahead. It looks like our little rock haven in the Arctic ocean will be home for the next little while.